In the fall, I’m all about those dark colors like olive greens, mustard yellows and browns. But as soon as the holidays are over and we are deep into winter, I love transitioning to brighter colors and pastels like winter white, baby pinks and lavender. Because there are no leaves or flowers around, these colors help brighten up a dull winters day. And they sure do look pretty against snow, right? Trust me; pastels are not only for spring but are a total winter staple too! Pastels are my favorite and you are killing in this look! Your jacket is a dream and that bag is giving me unicorn vibes. So gorgeous! You are rocking this look! 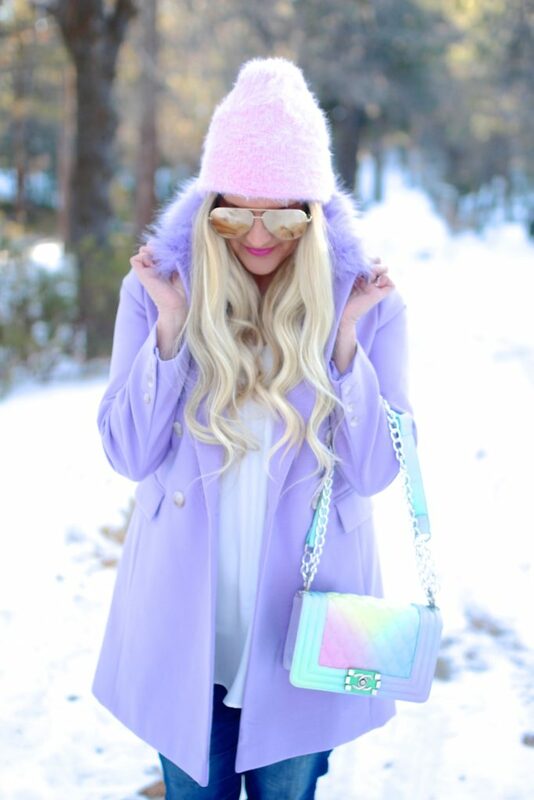 All the colors are beautiful and you are so right about pastels, it truly looks stunning against the snow. Btw, can I just swoon a little bit longer with your handbag? Ok seriously obsessed! Have a super long weekend and safe travels! 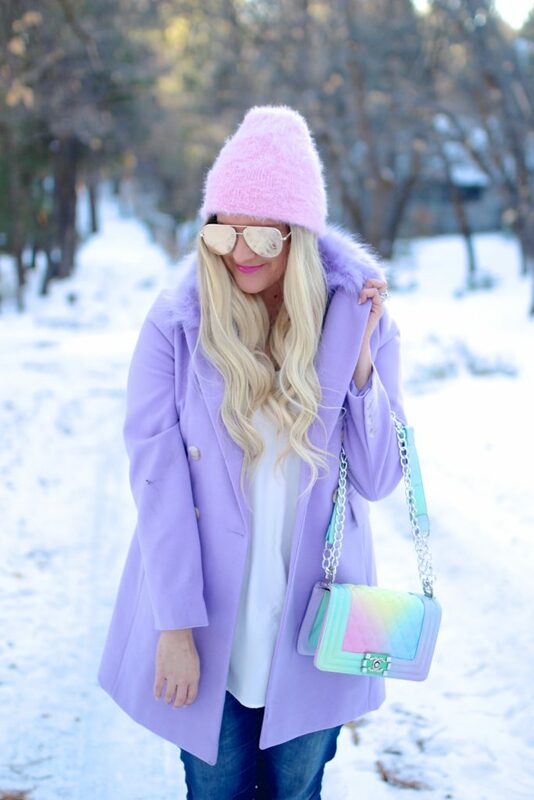 Bright pastels in the snow are SO pretty! Love this, babe! Such a beautiful look against the snow! Love you in pastels. I love your coat. The color is so lovely. I love seeing all this color during these drab winter months. You look adorable! Love that hat and coat! 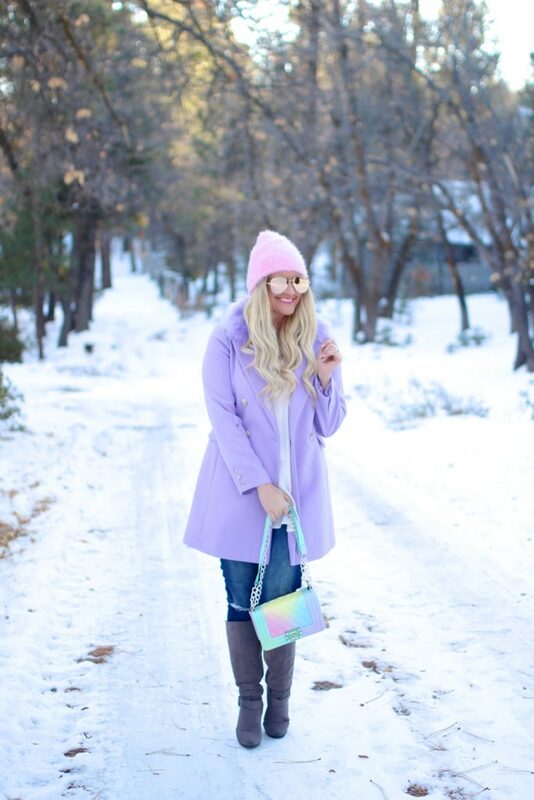 These pastels are so pretty against the snow! They definitely brighten up a dreary day! You look adorable! Hope that you are having a wonderful weekend 🙂 Our summer heatwave is continuing, today will be a quiet day in the aircon I think! OMG I’m loving all these colors!! You are so rocking the pastels Shauna. The coat, bag and beanie are beyond gorgeous. As a matter of fact I purchased a similar beanie in that gorgeous lavender and need to wear it ASAP. These are incredibly cute colors dear! Love the jacket, so pretty and cozy.